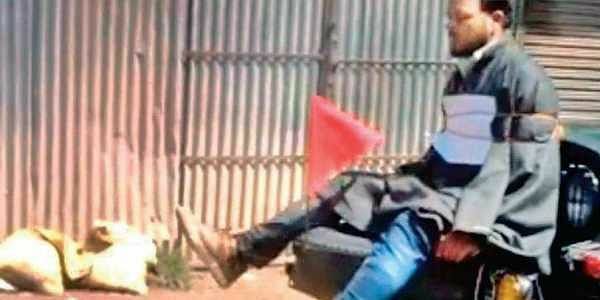 The state government earlier had refused to act on the commission order awarding Rs 10-lakh compensation to Farooq Ahmad Dar, who was used as a "human shield" by an Army officer earlier this year. SRINAGAR: The Jammu and Kashmir State Human Rights Commission (SHRC) will next month hear an appeal against state government's refusal to act on the commission order awarding Rs 10-lakh compensation to Farooq Ahmad Dar, who was used as a "human shield" by an Army officer earlier this year. Chairman SHRC Justice (rtd) Bilal Nazki yesterday heard the appeal filed by Dar, against the government's decision not to act on the earlier recommendation of the commission. Justice Nazki listed the matter for final arguments before a division bench of the commission on December 12 and ordered the state government to clear its stand by that date. Dar was tied to the bonnet of an Army vehicle and taken around 19 villages in Budgam district during a Lok Sabha bypoll in April, purportedly as a shield against stone- pelters. A video showed Dar tied to the vehicle, evoking sharp reactions from the civil society. However, the Army backed the officer who tied Dar, and honoured with him with the Army chiefs Commendation Card for his sustained efforts in counter-insurgency operations. The officer said he took the step to save local people. The Army's claims that Dar was among the stone pelters was not substantiated by local police officials, who established Dar's statement that he was on his way to another village to offer condolences. The SHRC in July awarded a compensation of Rs 10 lakh to the victim However, in its reply, the state government said the empowered committee of the government examined the order of the rights panel and observed that the grounds on which the compensation was recommended "cannot be accepted". "That pending completion of the investigation in the matter, the recommendation with regard to payment of compensation to the complainant (Dar), shall tantamount to establish the guilt of the accused without affording him an opportunity of being heard," the reply maintained. The government also said there was "no scheme or policy in vogue in the state, which could cover the payment of compensation" in such matters. The state government, it said, discharged its obligation by registering an FIR in the matter in the Beerwah police station and consequently initiating the investigation.